Have you heard of mesh stitchable fabric? Me either. I was thrilled to get my hands on this stuff and give it a try. 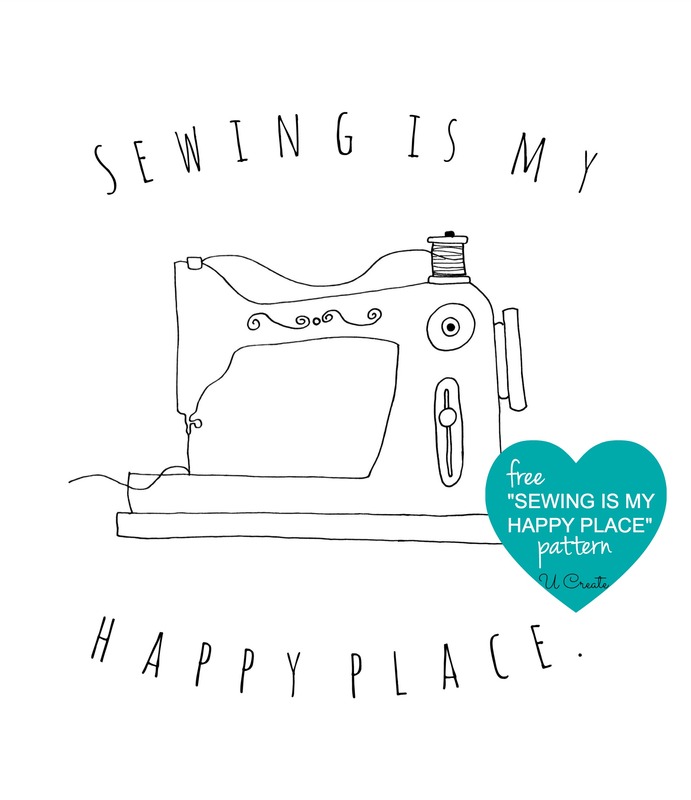 I designed a “Sewing is My Happy Place” pattern and decided to give it a try on this mesh…I love how it turned out. I even had the guts to iron and sew on the mesh – and it worked! Trace image onto mesh fabric using a transfer pen or a marker. Stitch the design using DMC floss in the above colors. I used 3 strands each. 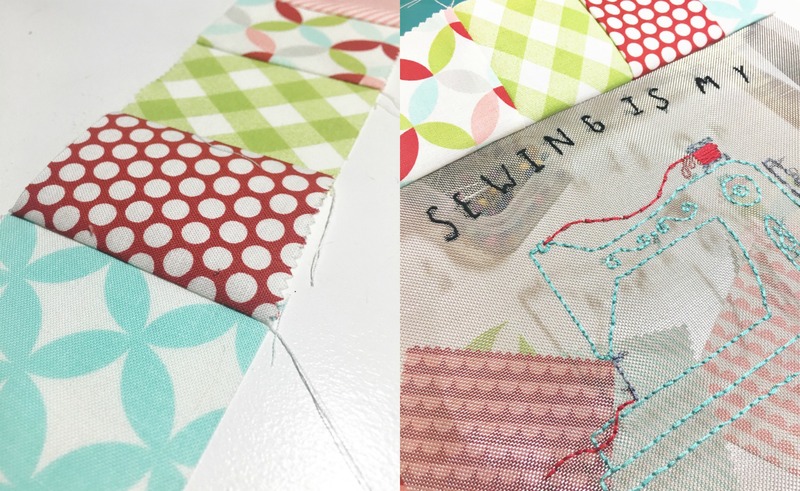 Sew your fabric squares together into strips. Next, attach them to the mesh. 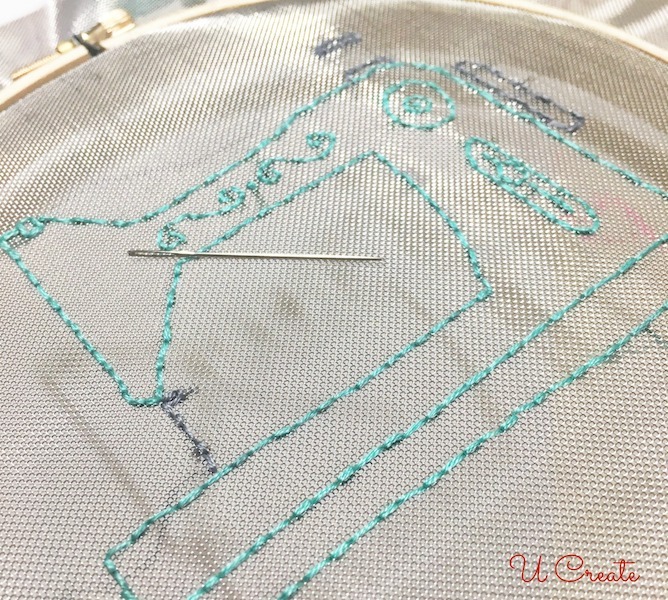 I used a zig-zag stitch on my sewing machine and it worked great. Iron your seams so they lays flat. Trim to fit an 8×10 picture and it’s ready to frame and display! oh my gosh, I would sew this for my mom and give it to her as a gift! My mind is exploding with all the other possibilities! Love your pattern! I would like to try both the mesh and the cork. Not sure what yet. I would like to make something with all three! Stitchable mesh? What an awesome idea! The see-through look really shows off your stitching! 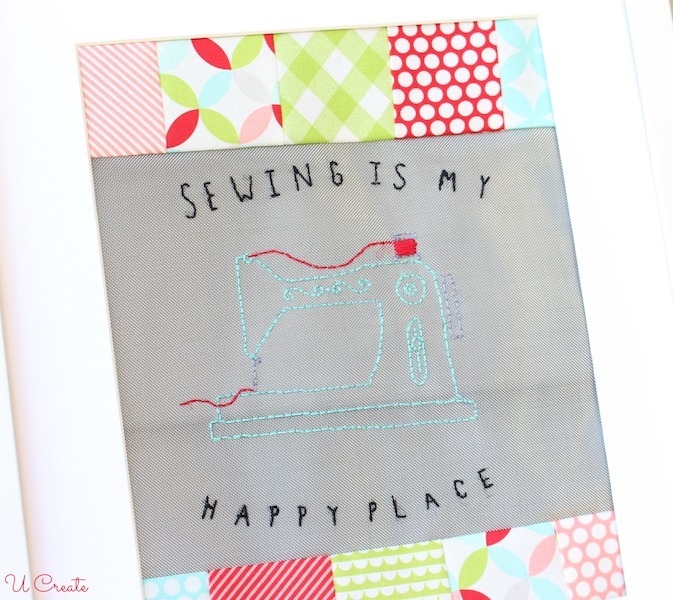 I’d stitch up a project just like yours for my happy place…my sewing room! Hi Kathy! You are the winner of the DMC giveaway! Can you please contact me with your address info? Email me kari@u-createcrafts.com – CONGRATS! I’ve been dying to try the cork fabric ever since I saw a bunny rabbit pattern made using it. That’s what I’d make first with the prize! I would like to make an apron. I am loving your sewing sign! That is adorable! I’d love to make one for my hobby room! I am really loving these new products! I think we would use these to make some Christmas gifts, especially the cuffs for some cousins. I would love to make some jewelry! I want to make some cork coasters, a bracelet and an embroidered wall hanging. I think this mesh would be great for some lightweight jewelry. Your machine is so cute, I would love to make one of those too for my sewing room. That is the coolest stuff I’ve seen in a while!! I of course would make something to wear, hmmmm maybe earrings and a necklace with a bracelet too!! How fun!! I’d love to create a wall hanging for our Grammy and Grandpa. He’s battling lymphoma and his kidneys are failing. They live in AZ and we’re in MI, so I’d send them something so that when they looked at it, they’d know we are thinking of them! Goodness, where to start. I would definitely have to get cork and mesh and then my imagination can run wild. I love how this turned out!!! It’s perfect, Sis. These products look fun! I would probably make some seasonal wall art for my entryway. I have no idea what I would make, but I love the idea of the see through mesh. Maybe something with my favorite fabric peeking from behind. I want to try the cork.Love the look it has. a sign for my craft shed! I’d like to try personalized cup cozies with the stitchable cork. I would use it to make this darling wall hanging for my sewing room! Then, I would do a “Welcome” banner for my door! Love it! 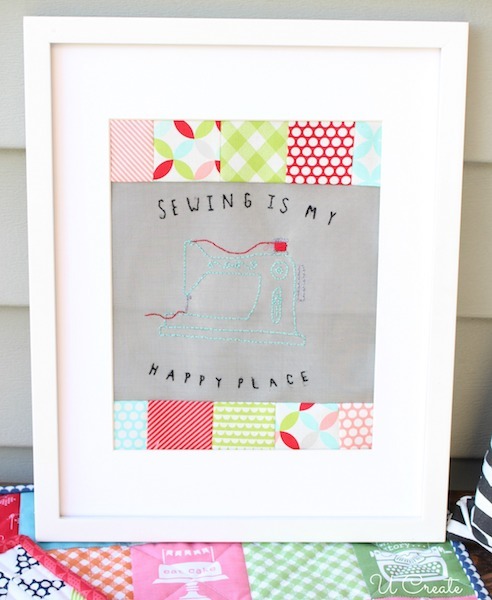 That is one cute and adorable stitching project. Love the possibilities to create with DMC products. I’d make hoop art decors and maybe try something new like making jewerly with them. Thank you for sharing your project. It is an inspiration. I want one of these for my sewing room!!! Love it!!! OK, so you have me wanting to try the mesh! Sweet! Wow the possibilities are endless,,,hoop art and cuffs are on my list of to do!! How fun! I’m impressed that you could iron it and everything. I think embroidering the mesh and incorporating it into a mixed-media painting would be really fun. I would like to make some jewelry! Really cute pattern! I like this simple design. What a wonderful add to a sewing machine cover! I love to embroider! This is so cute! I love the vintage sewing machine! I’ve never tried the cork or the mesh. I would love to play around with both. The mesh could be a cute accent piece to a mesh beach tote. I’ve seen some made from window screen and I think this would match that pretty well. I would love to make an embroidered pouch for my sister. I’d love to try this! I think stitching up a bracelet or earrings would be really fun with this. Thanks for the chance to win! I think the mesh would be excellent for jewelry; I can’t wait to try it! I would love to make your pattern for my craft room! I would love to create earrings and a pendant with the mesh fabric. I have been stitching for YEARS! Now there are so many new materials to experiment with! Thank you ladies for the new ideas and challenges! Looking forward to “playing” with the cork and sewable mesh fabrics. This reminds me of my mom so much, I think I would make it for her if I were to win! I’d make those earrings for my daughter and stitch a tiny cupcake on them! I would love to try the mesh or cork! I love the sheerness of the mesh but also the texture of the cork! I love your project and it is very generous of you to share it with us. I am definitely making this for my sewing room, it’s beautiful! I’d like to use the stitchable fabric to make an embroidered frame for a photo of our grandchildren. I would love to try the mesh…for the same quote. It would be for my daughter-in-love. She has been such an inspiration to me.